I was watching a cooking show recently with a football game foods theme and they were making potato skins. They looked delicious and it got me to thinking, I haven't eaten potato skins since I was about 10 probably. I mean, it isn't something I really see often at the restaurants I go to and it isn't like I ever made them at home. But I love the idea of them. They are usually loaded up with some pretty greasy stuff at most restaurants like bacon, cheese and sour cream so even if they were on a menu somewhere they are most likely not at all vegan or something I would eat. But you know me, I like to veganize things and make them a bit healthier, so I decided to do just that. Well, kind of. Let me explain, what I made wasn't exactly skins because I instead sliced the potatoes and made little loaded baked potato bites. You know the concept of sweet potato toast? Well I thought why not use it with regular potatoes. I thought about making large ones and slicing the potato lengthwise, which you can totally do if you are having these for dinner or something and you want them more like actual potato skins without all of the work of scooping flesh (plus no wasting this way). But, I thought since it is the Holiday season, why not make them little bites perfect for serving at parties? So, I sliced a few potatoes thinly into cute little rounds, and roasted them with some olive oil to create delicious little potato disks. Now, I thought about making a vegan sour cream to top them off with but I instead decided on using guacamole. After all, it is creamy, delicious, AND healthy. 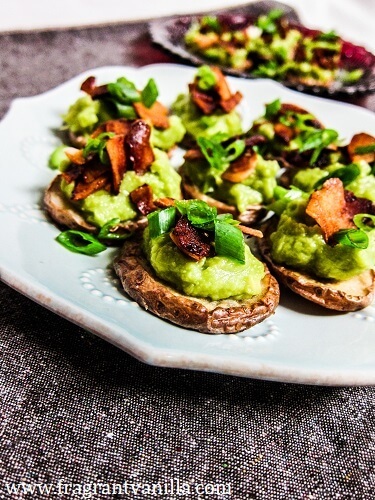 Already winning over those traditional potato skins. I wanted to top them with bacon too. No greasy animal products here though. I made a crispy coconut bacon to top them off. Trust me, if you have never tried coconut bacon it is something you have to try. It is the most delicious vegan bacon substitute I have had and perfect for crumbing over things like salads or popcorn or these little bites. Don't do it until the last minute before serving though because you want them to stay nice and crispy not absorb moisture (this is not an appetizer that should be assembled more than an hour before serving). Lastly, I sprinkled scallions and red pepper flakes over them. They looked adorable, but not only that, they were super delicious. If I were at a party, I would be the one that kept coming back and eating all of them. You know what I mean. I was kind of like that as a kid with anything involving cheese. No cheese here though, just vegan deliciousness. 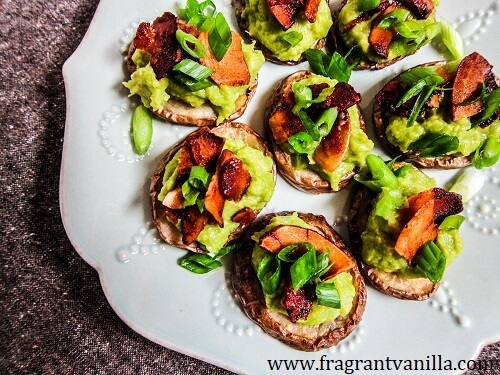 These are not only vegan, but they happen to be completely gluten free and nut free too, so they are perfect if you are serving guests with allergies to those things. Happy Holiday season! Toss the potatoes with just enough olive oil to coat, and sea salt. Spread the potatoes out on the sheet pan, place in the oven and roast until golden brown, about 25 minutes depending on your oven. Remove from the oven and let cool until just warm or at room temperature. To make the coconut bacon, preheat the oven to 350F degrees, and line a sheet pan with parchment. Toss the large flake coconut with the tamari, liquid smoke and maple syrup and spread out on the pan. Place in the oven and bake for about 12-15 minutes (depending on your oven), keeping a close eye at the end and checking it in the final minutes because it burns fast. Remove from oven and let cool. 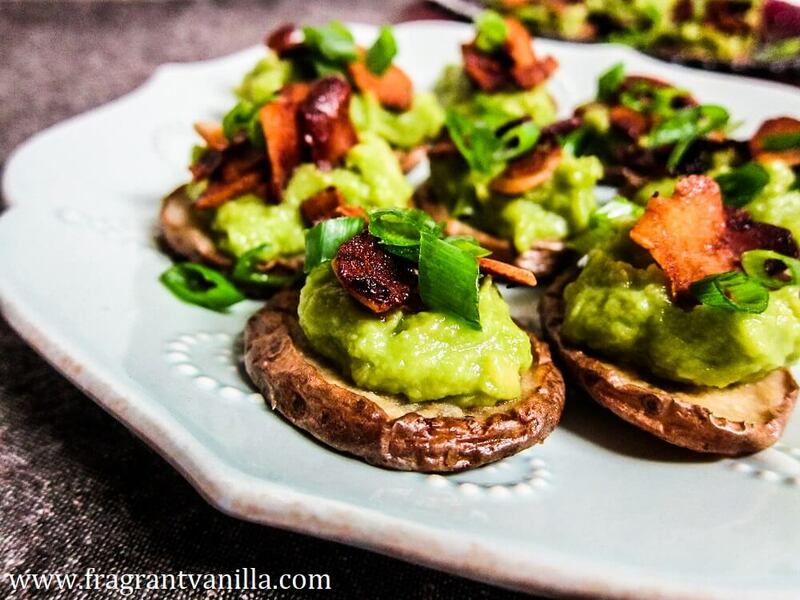 Spoon some of the guacamole onto each potato slice. 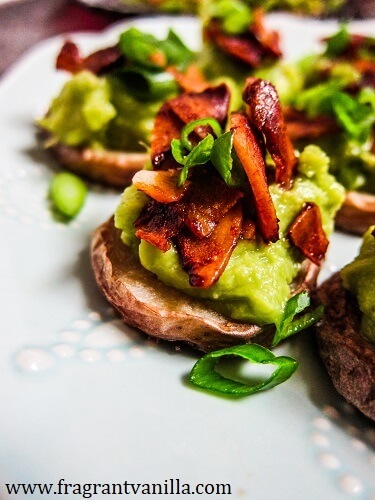 Place a little coconut bacon and scallions on each toast and sprinkle them with a little red pepper flakes. Arrange on a plate and serve!